Rochester is a rural community in southwestern Thurston County, Washington. It is located along I-5 between Olympia and Centralia, and between the larger metro areas of Seattle and Portland, Oregon. Its population is about 12,000 residents, most of whom might commute to one of the bigger cities nearby. Homes for sale in the area are generally older, but tend to come with large lots or acreage. 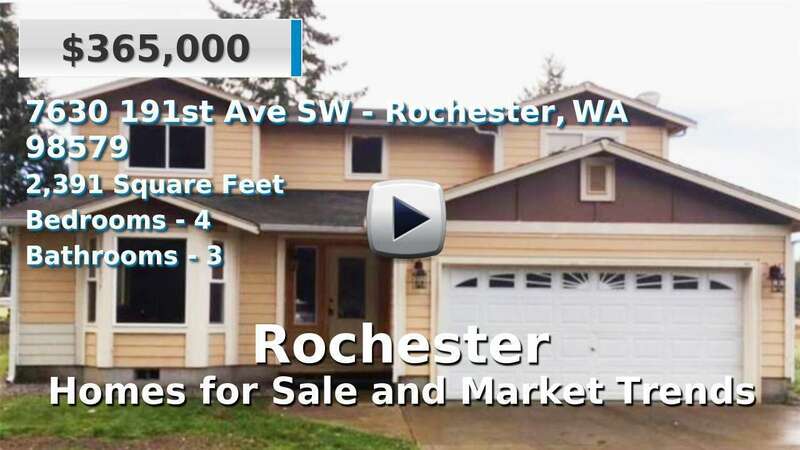 Rochester is just south of the Capitol State Forest and is situated between the Black and Chehalis Rivers. 3 Beds | 2.5 Baths | 2543 sq. Ft.
2 Beds | 2 Baths | 1600 sq. Ft.
2 Beds | 1.5 Baths | 1150 sq. Ft.
4 Beds | 2.75 Baths | 2610 sq. Ft.
3 Beds | 1.5 Baths | 1840 sq. Ft.
4 Beds | 2.5 Baths | 2391 sq. Ft.
3 Beds | 3 Baths | 2196 sq. Ft.
4 Beds | 2.75 Baths | 2700 sq. Ft.
3 Beds | 2.5 Baths | 1943 sq. Ft.
3 Beds | 2 Baths | 2075 sq. Ft.
3 Beds | 2.25 Baths | 2824 sq. Ft.